Guests will not leave hungry with Bruegger’s Bagels’ new summer line-up featuring the Back Bay Egg Sandwich made with egg, bacon, Swiss cheese, tomatoes, pickled red onions and smoked salmon cream cheese, all on a poppy seed bagel. On the lunch menu, the new Bacon & Blue Burger Melt is a summer picnic on a bagel, featuring a 100 percent beef patty topped with peppered bacon, blue cheese, Swiss cheese and apple cider coleslaw. Returning summertime favorite the Pretzel Bagel harkens back to sunny days and warm nights at the baseball game. The Pretzel Bagel smells and tastes like a classic soft pretzel, salty and crunchy on the outside and chewy on the inside, and can be enjoyed as part of any sandwich, or with a simple side of mustard, ballpark style. Another seasonal return to the Bruegger’s Bagels menu is Whipped Blueberry Greek Cream Cheese & Greek Yogurt, which adds yogurt to the mix for a lighter, easier-to-spread texture with four times the protein and 50 percent less fat. Its tangy, creamy flavor complements any of the bakery’s 15-plus bagel varieties. Rounding out the summer menu with a beach vacation vibe is Coconut Iced Coffee (which can also be served hot), a fresh breath of sea air that is reminiscent of the fruity, refreshing drinks of the Caribbean. 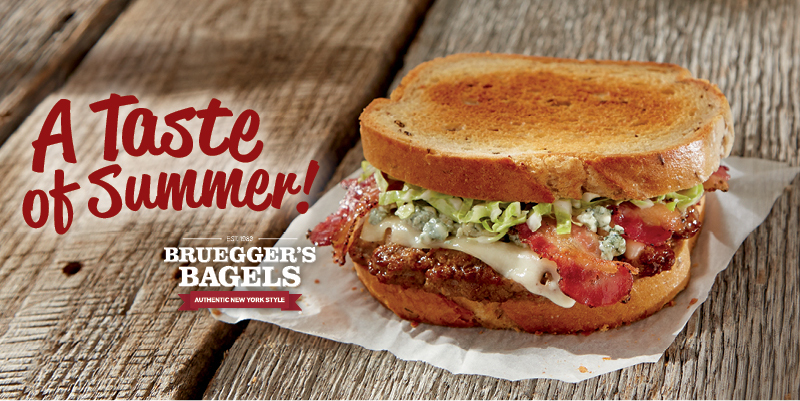 The summer menu will be available through Sept. 15 at participating Bruegger’s Bagels locations. Bruegger’s Enterprises, Inc. (BEI), a leader in the fast-casual restaurant segment, operates 290 Bruegger’s Bagels bakeries in North America. Renowned for its authentic fresh-baked bagels, the chain also offers a wide variety of freshly prepared breakfast and lunch options made with high-quality, simple ingredients served with its unique brand of hospitality. Bruegger’s Bagels is dedicated to the communities it serves and supports charitable causes locally and nationally. BEI’s parent company, Groupe Le Duff, SA, is the world’s second-largest company in the bakery-cafe sector. Founded in 1983, BEI is headquartered in Burlington, Vermont. For more information, visit https://www.brueggers.com/, follow Bruegger’s on Facebook, Twitter, Instagram and Pinterest, and click here to sign up for the eClub to receive news and special offers.